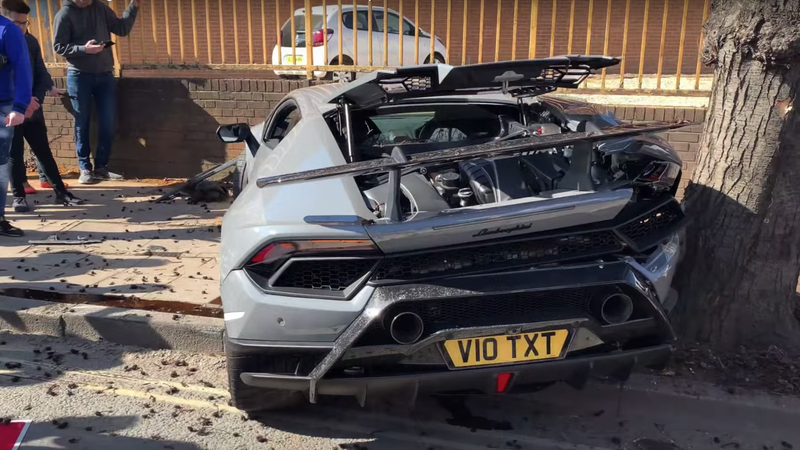 I’ve tried to do less gawking at other people’s unfortunate wrecks but this Lamborghini Huracan Performante wipeout, reportedly recorded over the weekend, showed up on my feed so many times I couldn’t help but investigate. And now I’m just confused. According to YouTuber F1 YMS who uploaded the clip, the crash happened yesterday at an event called HR Owens Supercars Sunday Meet. London, apparently. Or perhaps specifically “Victoria Road (A400) in North West London in Acton” as YouTube commenter Stewart Simon noted. And yeah, I found it on GoogleMaps (though it’s actually A4000). Anyway, ﻿two Lamborghinis are lined up making noise, one decides to skurt off, and before you realize what’s happening you just hear a bunch of “Oh Sh!t” being yelled and suddenly somehow the grey Huracan that had charged straight forward on a straight road ended up crippled and caved-in. Miraculously, it does not appear that anyone inside or out of the car got hurt. But it’s safe to say that the car was converted to a very expensive pile of garbage almost instantaneously. I watched the clip a few times, and I just don’t really get what’s going on. The camera is hiding behind the green Lamborghini when the grey one goes from straight to sideways, so we don’t get to definitively see what caused it to veer off the road. At first I thought perhaps the vehicle hit an unexpectedly slippery slab of paint or spilled whatever on the asphalt, but I would think a brand-new Lamborghini’s traction control system would be able to compensate for that. It’s also possible that the driver simply didn’t have a good grip on the steering wheel when they applied a big dose of brakes, but I feel like that too could be ironed out by a car as intelligent as a Huracan. Maybe the Lambo grazed one of the street-parked cars to its right and the driver overcompensated, sending the vehicle straight into the wall of the left? What happened is a shame, regardless. Everybody makes mistakes but let this be a reminder to be extra careful when you’re in something as ostentatious as a Lamborghini–your mistakes are going to be very public. Mashing the throttle on a crowded, skinny public street was clearly the first mistake in this video. So I’ll go ahead and take this opportunity to remind you not to do that, ever, either.